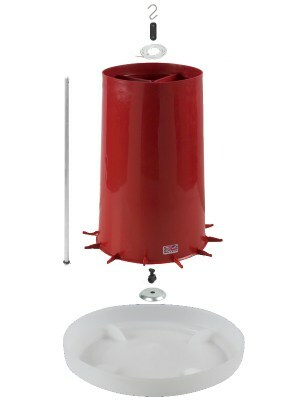 The BEC feeder range covers the basic needs for the poultry keeper who needs feeders suitable for chickens from day old to full grown, this range includes four sizes from 1kg up to 5kg, all have a red base with an easy to fit opaque push on top. As with the matching drinker range these are very easy to use and clean. Combine these feeders with the drinker range to accommodate all chickens from day old chicks increasing the feeder size as they mature. Although all this range have a fixed feed flow they are suitable for all types of poultry feed, the 1kg and 1.5kg are an ideal size for inside the brooder and for use with chick starter crumbs, all the feeders have a pre set feed flow control therefore no adjustments are required. Feeder size will need to increase as the chicks grow; the 3kg and the 5kg are ideally suitable for all types of feed including growers and layers pellets, corn or mash. These feeders are all ground based and it is advisable to sit these on a raised area to prevent the feed from being contaminated by the birds during their normal daily routine. 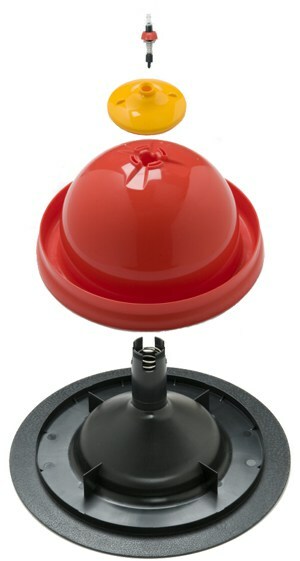 There is a raised Disco stand available from BEC that is perfect for all ground based drinkers or feeders. The BEC drinker range includes five sizes of fonts, covering all the basic needs of the average poultry keeper; they are all free standing and suitable for both outdoor and indoor use. If you are rearing chickens from day old chicks you will require drinkers that are safe and suitable for birds of varying ages and sizes. Day old chicks will need a small narrow lipped drinker, the BEC 1Ltr and 1.5Ltr versions in this range are perfect as they have been specially designed to be shallow and narrow lipped, this will prevent the chicks from drowning. This size of drinker is ideal for the first two weeks or until the chicks reach a size that prevents them from coming to any harm. 1ltr and 1.5ltr are suitable for up to ten chicks; if you have higher numbers – use multiple drinkers. The range then includes drinker sizes to accommodate the number of chicks you have hatched, I suggest that the next two sizes – the 3Ltr and 5Ltr are ideal for use with up to twelve tom fifteen growers as the chicks mature, this again depends on the quantity of chicks being reared, a constant supply of fresh water is required for all chickens so regular checks are needed. The 10Ltr version of this range is ideal as a ground standing drinker that is suitable for up to twelve adult birds both indoors and outdoors, ideally standing this on a raised area to prevent the water from becoming contaminated or use the raised Disco stand available from BEC that is perfect for all ground based drinkers. This range comes in three sizes – 3, 6, and-12litres. The 6 & 12 litre versions can be adapted to stand with or without the optional legs, as with all drinkers they must be stood on level ground to avoid leakage. The drinker has a twist lock fit base that allows you to fill the drinker with the base removed and the top turned over, once full then just simply twist and lock the base into position. The Combination drinker can be used in a variety of ways, it can be free standing on its base or it has the option to be stood on its own legs that are press fixed into the base and give a floor clearance of 7.5 cms, it can also be used as a hanging drinker using the extra strong handle that is fixed to the top of the drinker. Hanging the Combination drinker is very easy as the handle has a central hole to attach a chain or cable to and this levels the drinker automatically. The hanging height will vary subject to breed size but the average height for chickens is approximately 23 to 30 cms from the ground. Legs for these drinkers are an optional extra but are highly recommended; these are an easy push fit into the base. 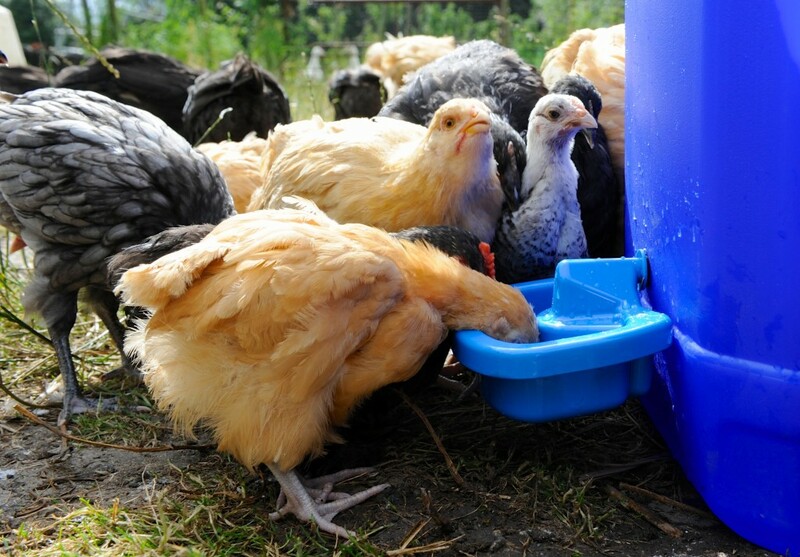 The Combination drinkers are suitable for all sizes of adult birds from True Bantams to Large Fowl, the size required depends on the number of birds kept – but working on a daily basis the 3ltr will accommodate up to 3-4 bantams, the 6ltr up to 6 birds and the 12ltr around 8-10 birds – this may vary subject to bird sizes and the weather conditions, replacing the water daily is very important and in hot weather this may have to be repeated more than once a day. The BEC Drinker Range is available in 1,1.5, 3, 5 and 10 litre capacities. All are designed for use where no piped water is available. “This drinker is quite unique as it comes with a fitted handle that converts the top of the drinker into a very handy and useful bucket. The drinker has a capacity of 10ltrs and is part of the BEC Basic drinker range. It has a clear see through top that is a push fit onto a strong red base. The handle fits neatly into the base when not in use, and the drinker is very easy to clean and use.